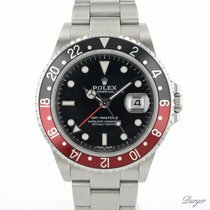 Rolex GMT-Master II Coke Bezel Stainless Steel 40MM "Z Series"
Rolex GMT-Master II Coke Bezel Stainless Steel 40MM "R Series"
The Rolex Coke is a GMT-Master II with a black and red bezel. This wristwatch can display up to three time zones simultaneously using its bezel and 24-hour hand. Vintage models, such as the "Fat Lady" are highly coveted among collectors. The Rolex Coke has been making pilots' hearts beat faster since it was introduced in the mid-1980s. This wristwatch had the reference number 16760 and was the first GMT-Master II that Rolex brought onto the market. Its most distinctive feature was its black and red bezel. 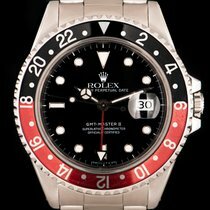 Thanks to this bezel, which featured the same colors as a Coca-Cola can, the GMT Master II was nicknamed the Rolex Coke. Due to its caliber, the 3085, the Rolex 16760 had a thicker case, earning it two more nicknames: " Fat Lady" and " Sophia Loren ." The GMT-Master with reference number 16750 features the caliber 3075 and is slightly thinner. As Rolex only produced the 16760 for a few years, this reference number is quite rare today and beloved amongst collectors. 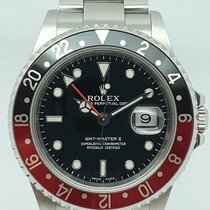 The GMT-Master II with reference number 16710 replaced the "Fat Lady" and was in production until 2007. Unsurprisingly, there are far more examples of this model on the market, making their prices much more affordable than those of the 16760. 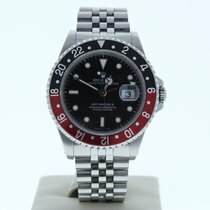 How much does a Rolex Coke cost compared to other GMT-Master II models? 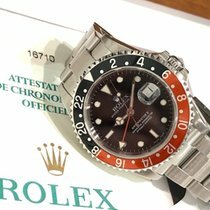 If you're interested in buying a Rolex Coke, you have the choice between the reference numbers 16760 ("Fat Lady") and 16710. 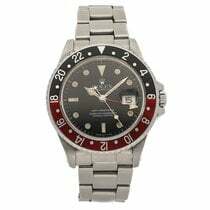 As the first generation of GMT-Master II watches was only produced for a few years, there are comparatively few models with reference number 16760 on the market. The prices for pre-owned watches in very good condition start around 9,900 USD. However, a Coke from the first years of production can cost more than 24,700 USD if it's in very good condition. It's possible that these prices will rise in the next few years. Compared with a vintage Submariner, Rolex's most well-known diving watch, the Fat Lady is still rather inexpensive. Submariners in high demand, such as the 6538 from the 1950s, can cost over 123,700 USD. The Rolex Coke 16710 is a bit more affordable than its predecessor. You can purchase a pre-owned version in very good condition for around 9,200 USD. Sometimes, however, you can still find mint-condition 16710 timepieces. Prices for these Rolex Coke watches range between 13,600 and 24,700 USD. You have the choice between a five-link jubilee or three-link Oyster bracelet. The Oyster bracelet is primarily paired with the Submariner and the Sea-Dweller. Like the 16760, the 16710's bezel inlay is made of aluminum. The Rolex Coke is almost exclusively available as a pre-owned watch. New timepieces are extremely rare and are often more expensive than the current GMT-Master II ref. 116710LN . 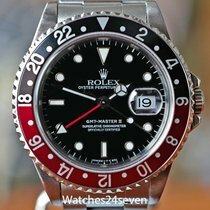 If you're not set on a black and red bezel, you can look for a Rolex Pepsi or Batman. The most affordable option would be the version with a black bezel and the reference number 116710LN. New models are available starting at around 9,300 USD. Pre-owned models cost about 8,400 USD. 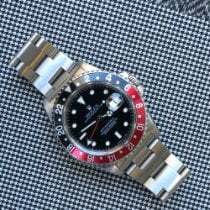 The Rolex Batman with reference number 116710BLNR is another Rolex Coke alternative. With a blue and black ceramic bezel, the BLNR has a more classic, conservative look than the Coke or Pepsi, and it goes extremely well with business attire. The polished middle links of the Oyster bracelet emphasize the GMT-Master II's classy look. At the moment, the Batman is one of the most coveted watches from this Genevan manufacturer. 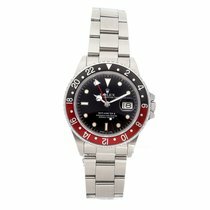 Therefore, you should plan on waiting a few months if you want to purchase a 116710BLNR in store. If you choose to buy the watch online on Chrono24, for example, then you won't have to wait as long. A new Rolex Batman timepiece costs around 12,400 USD online. The Rolex Pepsi is yet another alternative to the Rolex Coke. This GMT-Master II with a Cerachrom bezel has been on the market since 2014. The case of this timepiece with the reference number 116719BLRO is made of 18-karat white gold. Be sure to set aside at least 32,200 USD for a mint-condition 116719BLRO. The list price for this model is actually 43,000 USD, meaning you can save quite a bit of money by shopping online. 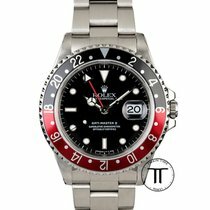 At Baselworld 2018, Rolex announced the long-anticipated release of the Pepsi GMT-Master II in stainless steel on a Jubilee bracelet. This model is powered by their superlative chronometer caliber 3285 with a 70-hour power reserve. It is listed under the reference number 126710BLRO and priced at 9,250 USD. The Rolex GMT-Master II Coke, unlike a normal GMT-Master, has a decisive advantage: Its hour hand can be set independently in hour increments thanks to the caliber 3085. This makes it easier to quickly change the time when you're in a new time zone. The hour, minute, and seconds hands must be set together with the caliber 3075, which powers the GMT-Master with reference number 16750. The bidirectional rotatable bezel aids in setting the second time zone. With its new caliber, the GMT-Master II can keep track of three time zones simultaneously. The Rolex Coke with reference number 16760 was the first Rolex GMT watch to feature sapphire glass. The successor to the "Fat Lady", the Rolex ref. 16710, was available with three different bezels: black, black and red, or blue and red. The blue and red bezel has been around since the GMT-Master was first introduced in the 1950s. The bezel inlay on the 16710 was still made out of aluminum, which is why you will often find them with faded colors that underscore their vintage look. The two current reference numbers are 116719BLRO for the white gold model and 126710BLRO for stainless steel; the four letters at the end stand for "bleu/rouge," French for "blue/red.". Both have a ceramic bezel made of Cerachrom, an extremely hard and scratch-resistant material that Rolex produces themselves. Thanks to this material, age-related discolorations are now a thing of the past. The so-called "Rolex Batman" is also available in stainless steel. This variation of the GMT-Master II has a blue and black Cerachrom bezel. The Batman's reference number is 116710BLNR. If you want a Rolex Coke to call your own, you can find predominantly pre-owned or vintage watches. However, as Rolex produced the 16710 until 2007, there are still a few new timepieces with this reference number out there if you look hard enough. Like many Rolex watches, the Coke maintains a stable value. When Rolex brought the Rolex Coke to the market in the 1980s, it was viewed as the next logical development to the GMT-Master. Rolex first developed the legendary GMT watch in the 1950s for the American airline Pan Am. Pilots were just beginning to fly intercontinental flights that passed through multiple time zones over the course of a few hours. Pan Am thus needed watches that could display multiple time zones simultaneously. Watches from the first generation of the GMT-Master have the reference number 6542 and are extremely rare today. Well-maintained watches from the 1950s often cost over 61,800 USD.